Tavern opened up in The Village Shops earlier this year, replacing Jose Peppers on the corner. A much-anticipated opening among our neighborhood, Tavern was met with mixed reviews. Mixed, not necessarily because of their food or atmosphere, but because Prairie Village is filled with young families and Tavern, while technically family-friendly, is not really a place for kids. Their pre-opening communications focused a lot on cocktails, as it is a unique selling point for them. David Smuckler, the 2007 champion of the Greater Kansas City Bartending Competition created a menu of freshly inspired, handcrafted cocktails and manages the restaurant's bar operations. I've been making my way through this menu, trip by trip, and all are delicious. Pictured above, clockwise starting with the martini glass: Rosemary Monk, Old Fashioned (The Stallion was boring this night), Thai Tavern Julep, and Rosewater Citrus Rickey. You'll probably limit yourself to just one of these signature cocktails, if you're like me, as they are priced at $8-10 each. I typically move on to a glass of wine with dinner or Ketel and water if I'm there just for cocktails. This particular night last week, we went with a couple of our dear friends, and our grumbling bellies dictated that we order two appetizers instead of just one. Here's the hummus ($7) - well-executed, but no twist here. Here are the Spicy Ahi 'Tacos' ($11), one of The Stallion's favorite menu items. 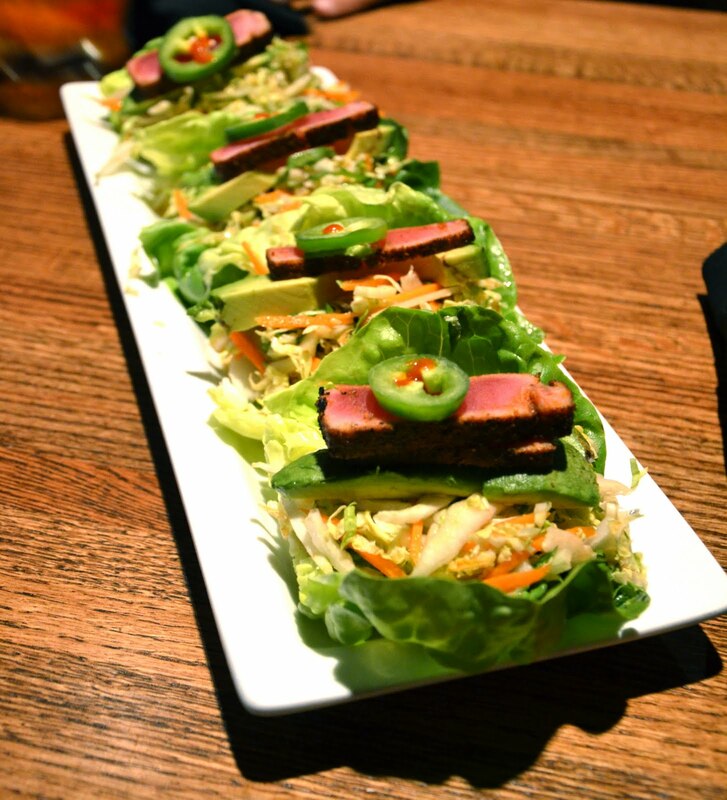 There are 4 individual lettuce-wrap 'tacos' with cabbage slaw, avocado, spicy-rubbed, seared Ahi tuna, and a fresh jalepeno slice. This would also make a great lunch for one - just be prepared for the spice! I love their house salad ($7). Simple and oh-so-good. They add sunflower seeds and dried cranberries to mixed greens, then toss it all with their own dressing. And that roll? It's a pretzel roll. Heavenly. Next on my list of things to learn to make. Who doesn't love a naughty little wedge salad ($7)? Tavern takes theirs up a notch with the addition of some crispy onions. The Stallion's main course: Grilled Pork Porterhouse ($17). Very strong dish, but The Stallion wished there was some sweetness to the sauce, and more of it. He likes sweet with his pork, and he definitely likes heavily seasoned food. The fish special of the day: California Halibut ($22). Cooked perfectly, and high quality fish. I ordered their Grilled Beef Tenderloin sandwich ($12), and it was exquisite. What a great way to make use of scraps of one of the most tender cuts of beef. The roll was perfectly toasted and piled high with tender grilled beef, provolone, roasted red pepper and arugula. YUM. And this? This is what we all determined as the winner for the evening. A regular on their menu, the Creole Chicken & Shrimp Pasta ($15) was perfection on a plate. Easy to overcook, the shrimp were nice and tender. There's even some Andouille sausage in there to round out the Creole flavor profile. We've been to Tavern at least 5 or 6 times since it opened, so I think it's safe to say that we like this place (proximity definitely plays into this). I love the modern vibe and it is upscale casual as it promises. (A bit of an oxymoron if you ask me, but I don't make up dining categories.) I've been there with the ladies for cocktails, for a late dinner-and-plan-our-wedding-with-our-laptops-at-the-table, and everything in between. If you live nearby, you should definitely put it in the back of your mind as a place to go next time you don't feel like making dinner. Their chicken tacos aren't bad either! Food looks amazing. I wish they had named it something different. The name Tavern made me think we were getting more of a pub type place with dark wood walls and delicious beer. I look forward to trying it some day.